A fascinating afternoon visit to two remote locations near the original Skye Ferry. 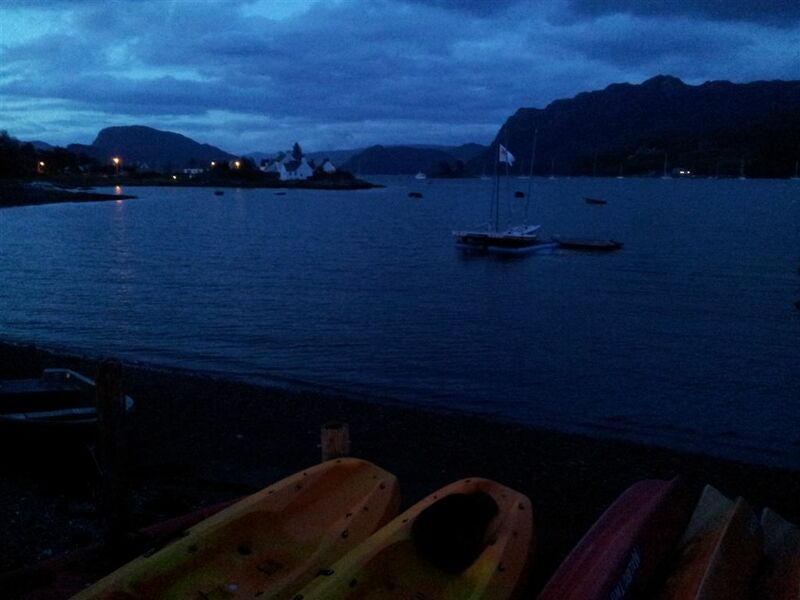 Day 2 (updated) – overnight the storm arrived with rain and wind loudly thumping on the guesthouse windows. Waking up tired from Thursdays Slioch walk I quickly checked a few forecasts which all seemed grim. Looking out at Plockton from the bedroom it was far darker and windier than the photo below suggests though at least the rain had eased. We finished unpacking before eventually heading out in the car along the single-track coast road towards Kyle, scanning the weather. Skye didnt look too inviting so we turned left to Glen Shiel with the aim of having a drive round or if lucky an afternoon walk. 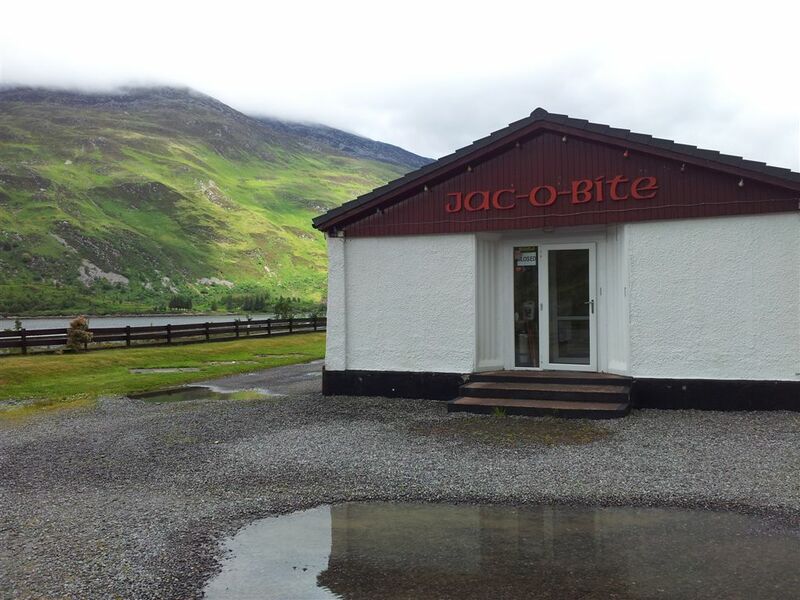 We took the opportunity to check out one of the Highlands most imaginatively titled cafes below…..which was unfortunately “closed for refurbishment” (ps now open). Whilst sat in the car park taking this photo we formulated a plan to drive up the the 9 mile Mam Ratagan pass from Shiel Bridge to Glenelg on the west coast. There were a couple of coastal walk options away from the big mountains that were pulling the bad weather down. 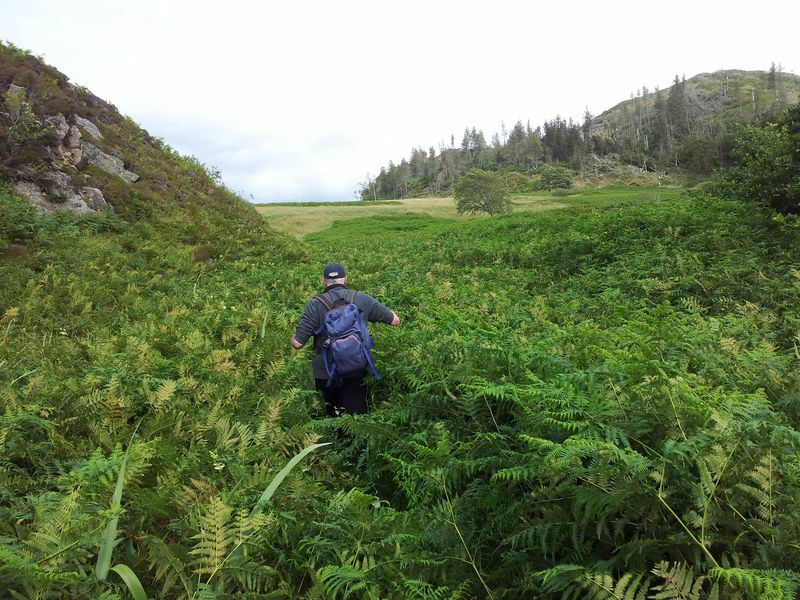 It would also be a chance to look around an area we’d only visited once before when doing Beinn Sgritheall in July 2000. The memories of that day came flooding back as we drove over this superb no-through road. 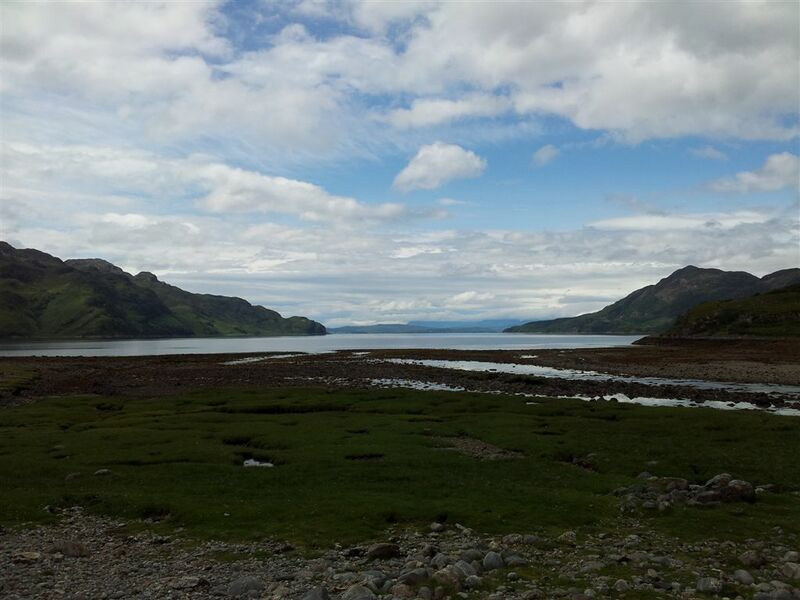 Once past Glenelg you hug the shore with views across to Skye then if you drive far enough the reclusive and remote north side of Knoydart bursts into view across Loch Horn. We passed a sign and Alan reminded me of a strange obsession we had all of 12 years ago. The sign was for ‘Sheena’s Tea Hut’. We never had time to visit back then but had been fascinated by the various signs and its startlingy remote location. An indelible impression had been left that day and we had resolved to return someday for that remote cuppa. We had even jokingly fantasised many times about Sheena, was she an attractive lonely smiley Highland lassie desperate for male company, full of tales of Highland life and shortbread? Anyway the chance to revisit on a non-mountain day was too good to ignore and we decided to drive on beyond Arnisdale to the end of the road at Corran and hopefully finally meet siren Sheena. We parked up at Corran, walked over a bridge past some small cottages and saw a final sign pointing to the very last cottage. At last after all these years we stood looking at the scene below. 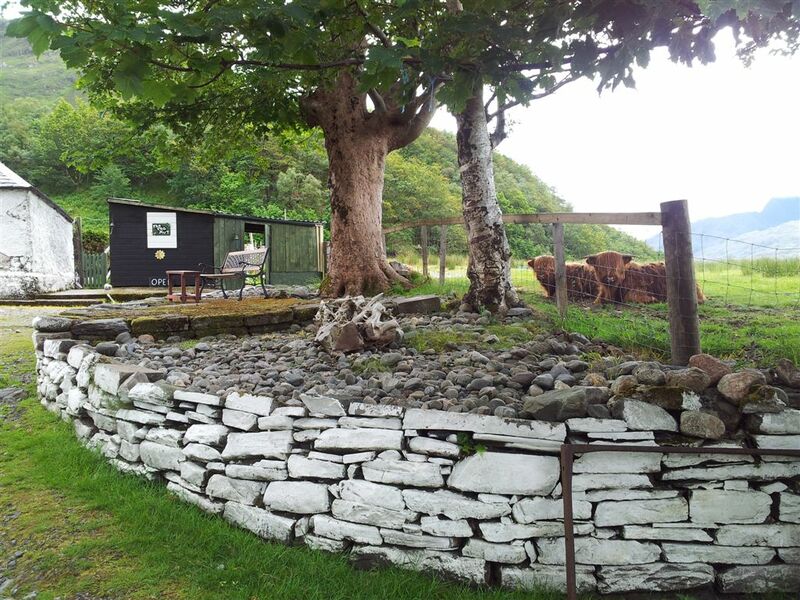 Sheena’s cottage is to the left, and the “tea hut” is a little green timbered shed which you walk through (passing the Highland cattle) to a small fenced patio garden. In the shed is a counter and on the counter is a door bell. I looked at Alan, he looked at me, I pressed it. Nothing happened, I pressed again, nothing. Alan in typically negative fashion said “nah must be closed, she probably doesnt live here anymore”. We stood in the patio garden gazing at the scenery about to leave when we heard a gate unlock, and then some steps, and then a mysterious figure appeared……it was Sheena……and she was 74 yrs old. I said “hello, didn’t think you were in”, she replied immediately “didn’t stop you ringing the bell did it”. Sheena may be elderly but she’s an admirably feisty lady:-) She served us from the counter & made 2 refreshing mugs of tea which we eagerly supped sat smiling in her patio. 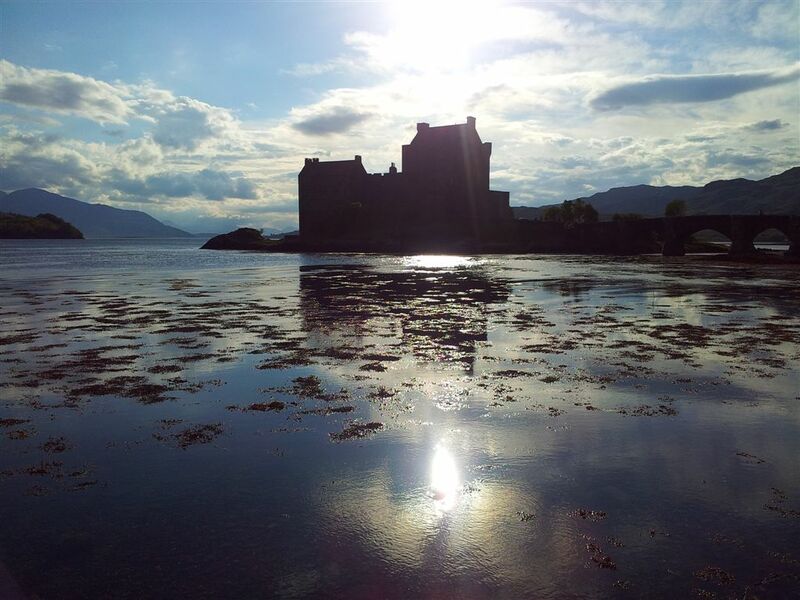 Anyone travelling around this area should make the diversion to Arnisdale and enjoy this truly wonderful experience. Feels like the end of the world, views around and across to Knoydart are an absolute delight and you won’t forget or regret it. Sheena returned for a chat about the Swallows trying to nest above the counter. Amazingly she gets some custom most days but doesnt get out much as she’s tied to the tearoom. Nice lady, hope she’s around for years to come, I’m still smiling about Sheena’s Tea Hut. 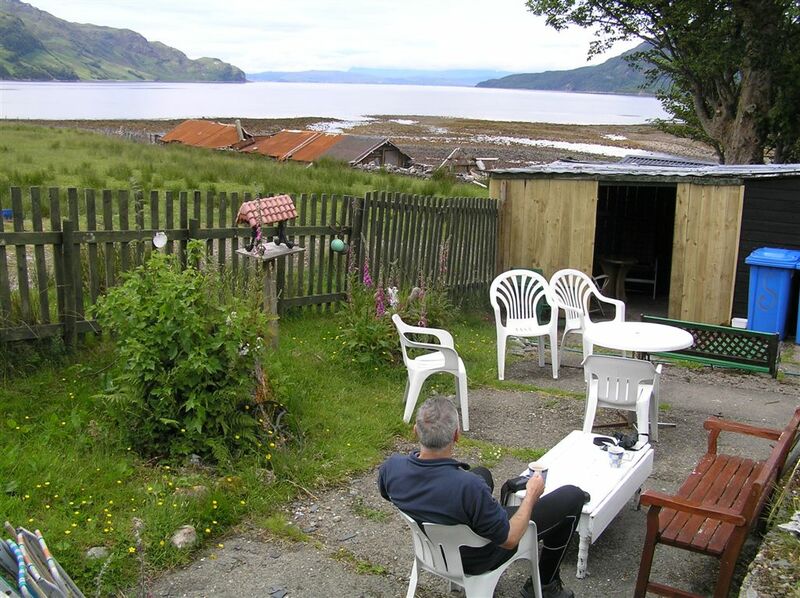 The view west from Sheena’s Tea Hut – how good is this!! 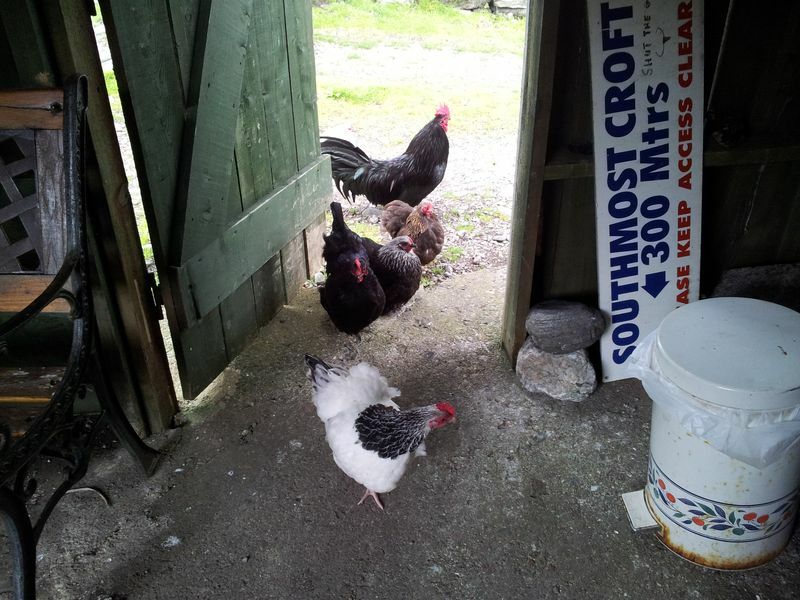 Update 2015;- Just heard that Sheena has now finally retired and moved to Uig in Skye. Wishing her all the best, hope she doesn’t find it too busy there 🙂 Sad news but good to hear she is ok. 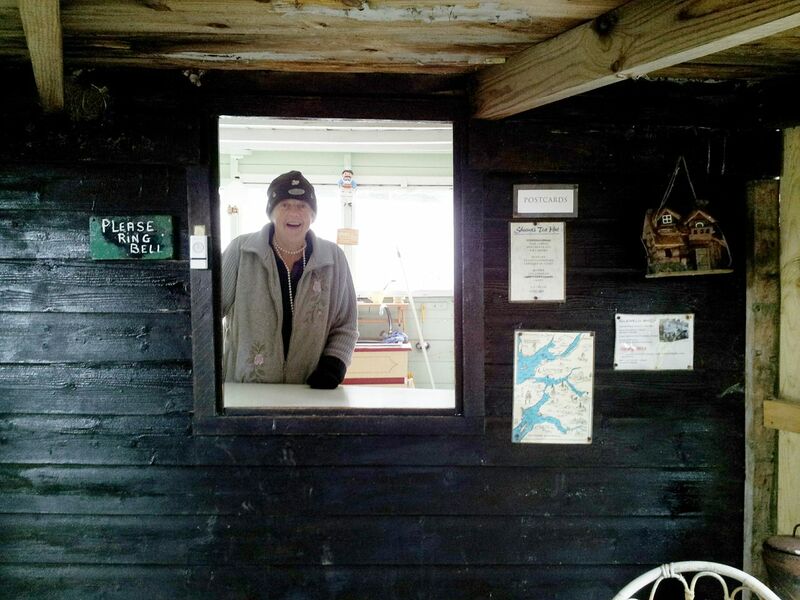 Wonderfully the Tea Hut lives on, the legacy now passed to Sheena’s daughter Lorraine. Will be visiting in summer to update further. Summer 2015 update – all open with an increased refreshment range! (Now back to 2012). Another amazing thing that afternoon was how the weather magically improved as we drove down towards the Tea Hut. Patches of blue sky had appeared although the inland upland areas still looked rough. The view below was from outside the Tea Hut westwards back along the road with the tent-like Sgritheall beginning to clear. 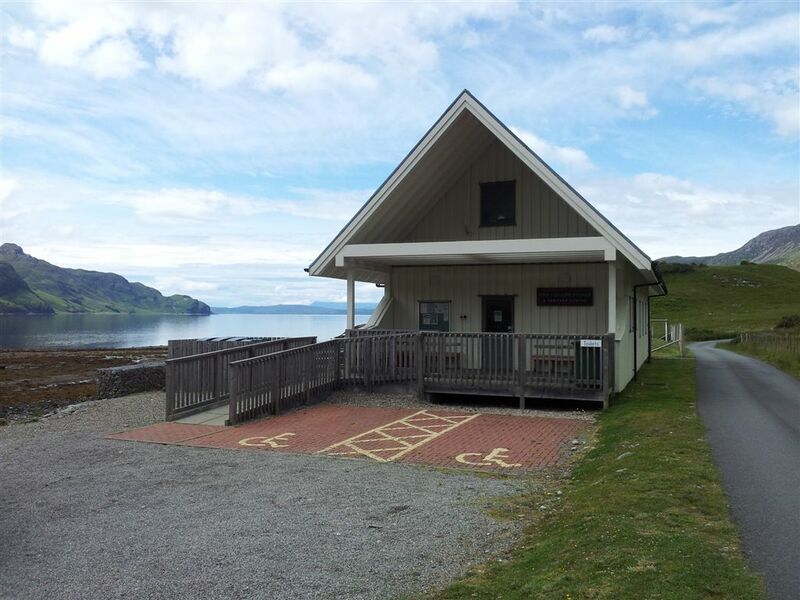 We still had a walk to do but there was no rush to leave, so once back at the car park we nipped into the unmanned Ceilidh House & Heritage Centre which houses an interesting pictorial history of the area. 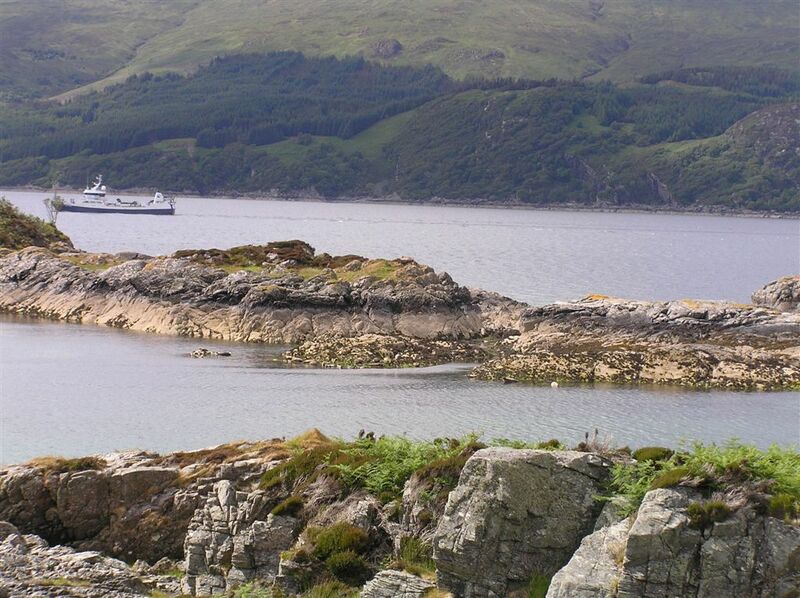 Hundreds had lived and fished here before the clearances. Back in the car we stopped briefly when finding some mobile reception to book food at the Plockton Inn that night. The view at this point was pleasant, the temperature now 21 deg. 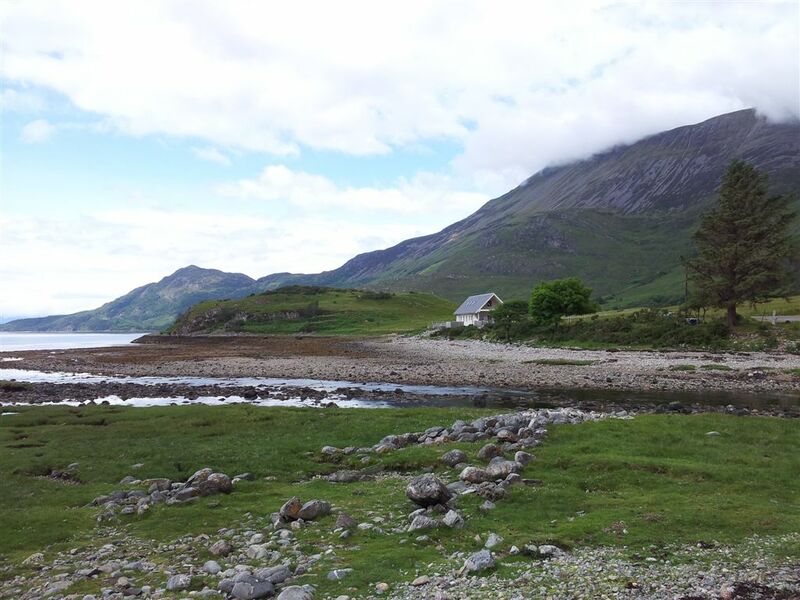 Soon we got to Sandaig, the starting point of the short walk located between Arnisdale and Glenelg. In typical Highland fashion there was no village, just a house on the road. We couldn’t find the forest track at first then discovered we’d parked south 200yards the wrong side of the house. Anyway soon we were off walking through the mostly felled forest zig zags and the Islands appeared below. 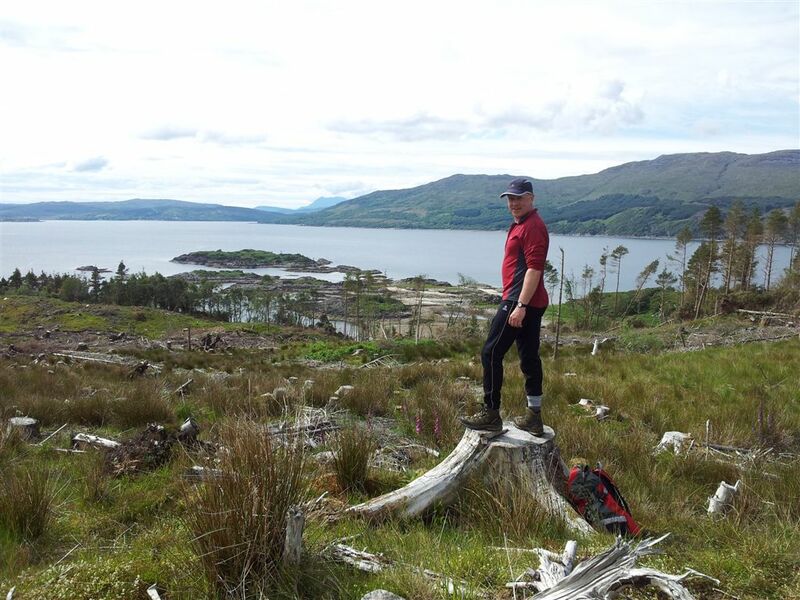 Sandaig Islands below – does me bum look big in this or what? 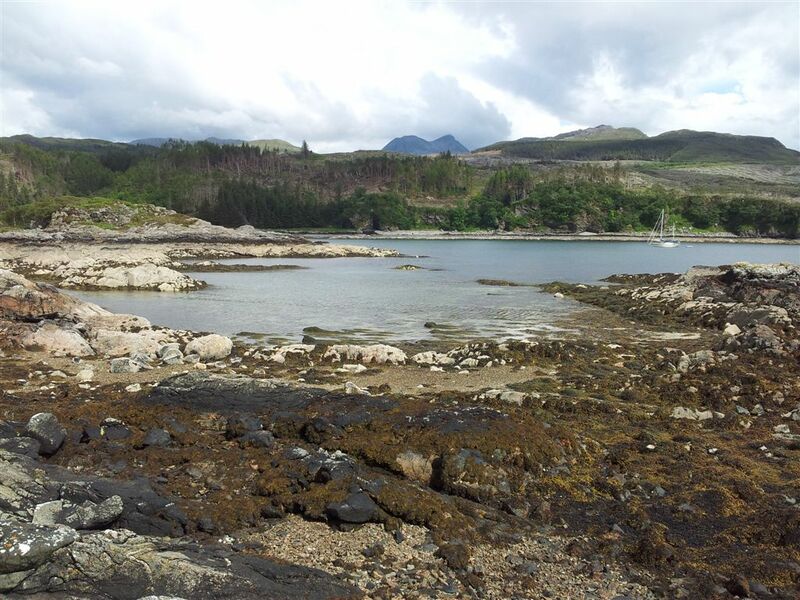 A few minutes further you arrive at the picturesque scene below, note a glimpse of Cuillin in the middle distance. Continue down via a gate into a grassy field with the Islands ahead. This field was ‘Camusfearna’ the home of author Gavin Maxwell who I remember as the author of the popular book and nature film from my childhood Ring of Bright Water Based on his experiences with otters the film was about a Londoner (Bill Travers) and his pet otter Mij living up on the Scottish coast. Maxwell lived here in partial seclusion and it turns out his life was far less straightforward than I imagined. Author, adventurist, wartime secret agent, shark fisherman and poet;- he was certainly a complicated character. Despite having once machine gunned a basking shark he later became an ardent conservationist and the inspiration to many aspiring naturists including wildlife presenter Terry Nutkins. 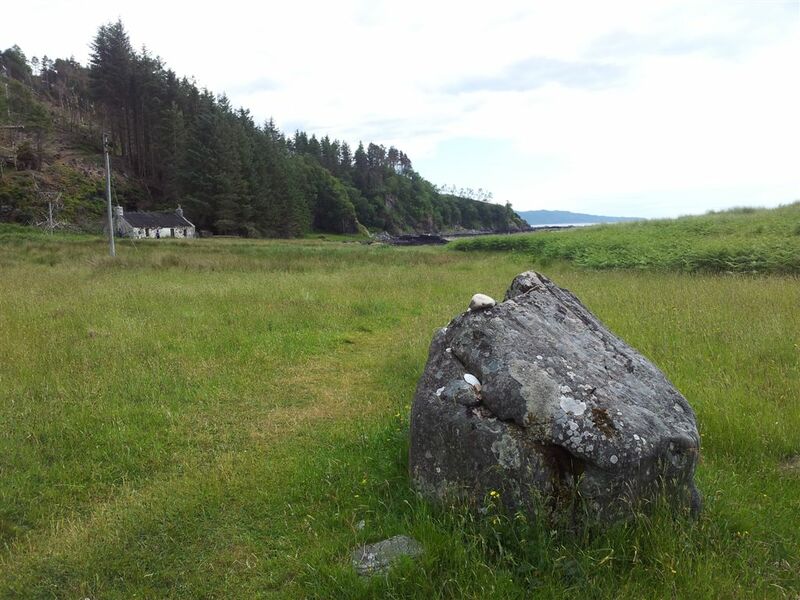 Maxwell’s ashes are buried under this memorial stone at Sandaig. 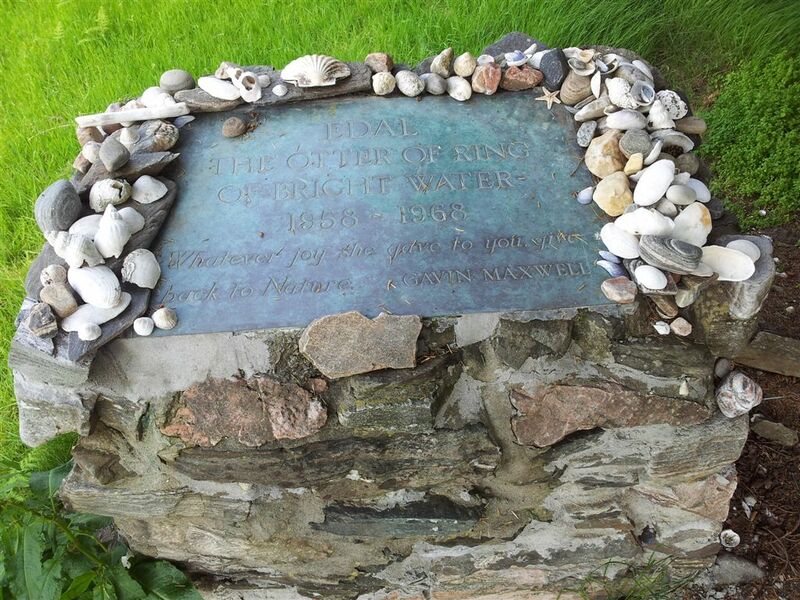 Maxwell’s favourite otter Edal had inspired the writing of Ring of Bright Water, sadly in 1968 a fire broke out at Camusfearna killing the otter, Maxwell was apparently devastated. There’s also a memorial to Edal just a few yards away heavily shaded under a tree. Maxwell died just one year later in 1969. We revisited 15th July 2014 which I’ve just discovered was Maxwells centenary, here’s a fascinating article by John Lister-Kaye on the interesting life of Gavin Maxwell. 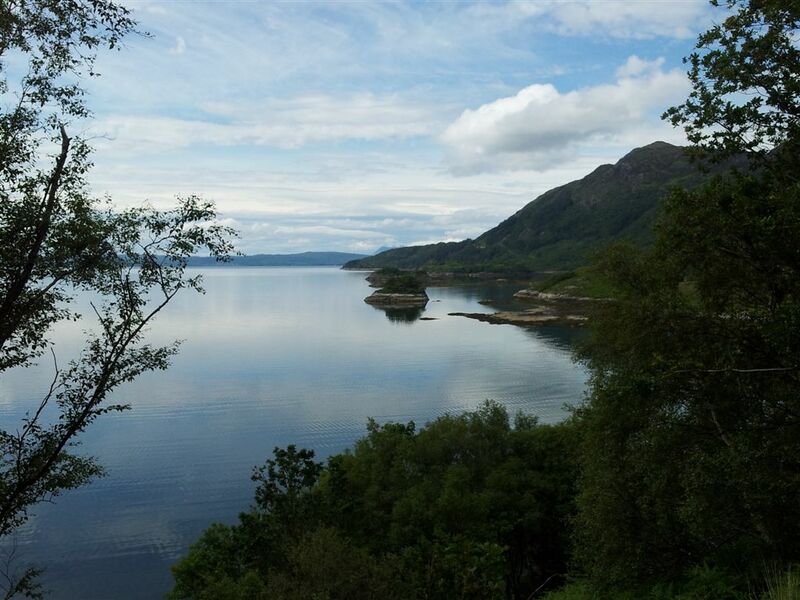 We moved on across to the Sandaig Islands, here looking back to Camusfearna (by the dark Conifer trees). That’s also Beinn Sgritheall on the centre horizon, now perfectly clear. Managed to fight my way around rocks and ferns to the highest point for these pics. 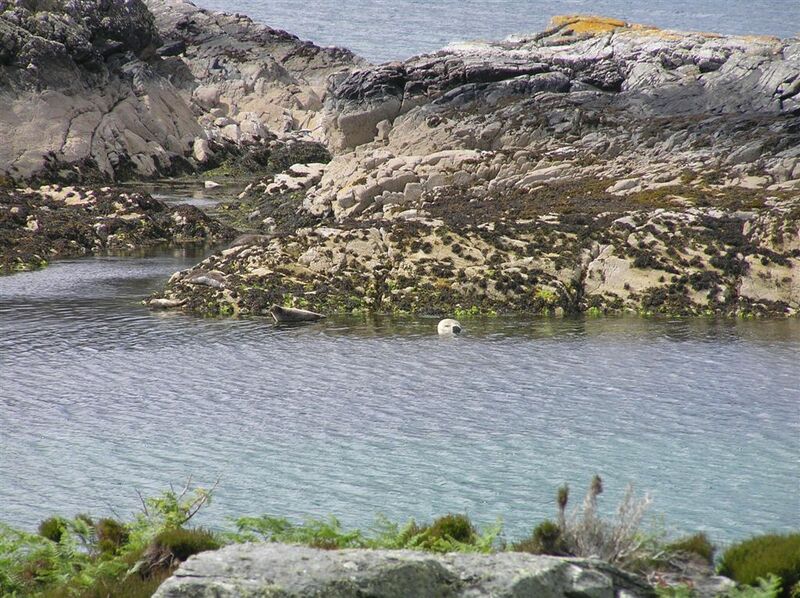 Noticed a white ‘rock’ which with binocs looked like a polar bears face, honest…. It’s a Polar Bear’s face, it is!! In reality it turned out to be the rear end of a seal, which apparently is less rough than a badgers. 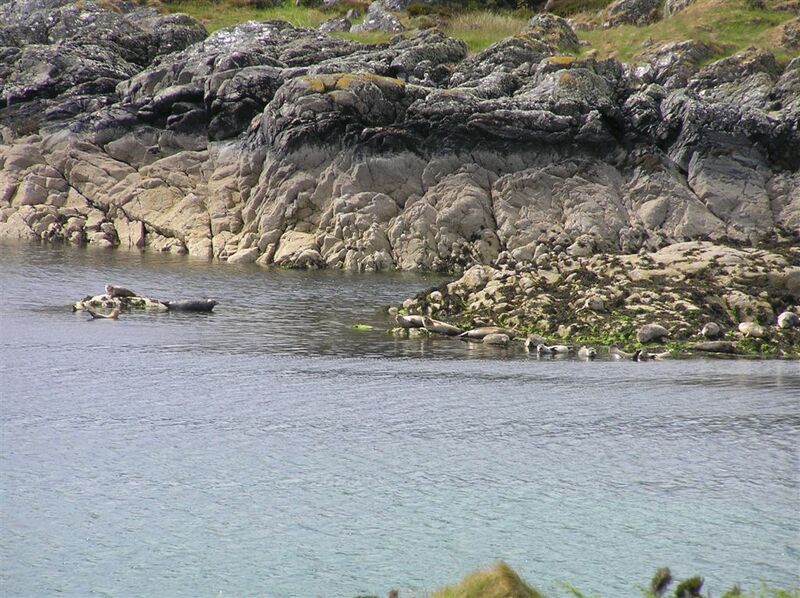 Counted 24 seals resting here, some cunningly disguised as rocks (& Polar Bears). Looking north the weather had really improved from winter to summer, warmer than photos suggested and I hadn’t even thought of packing a T shirt or shorts. We sat watching the seals, I’d noticed the channel below was a little smaller than before but the water was completely calm there. Five mins later I turned round and channel was under water. 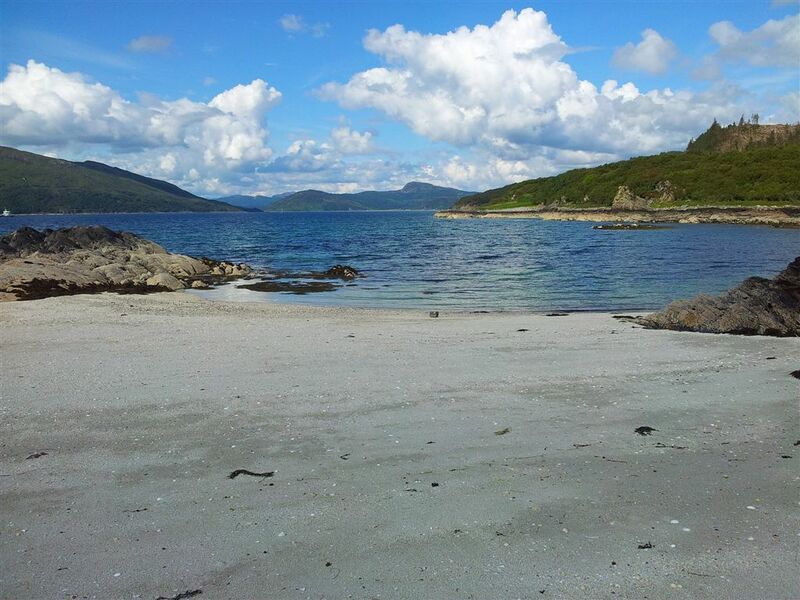 With hindsight this is probably why it’s called the Sandaig Islands! Luckily only a few inches so we dashed back to the main section. Nearly got wet so beware 🙂 Glenelg tide times here. This little white beach was a very very pleasant spot, I remember thinking I’ll be back in the office sat behind a desk soon, so take it all in. Final view below before heading back along the stream north of Camusfearna and up through the trees to make it a more circular walk back to the road and car. This was a really enjoyable easy 4 mile round walk and heavily recommended, we were out for nearly 3hrs most of which was strolling around. Here’s a map of the area showing the road from Shiel Bridge to Corran and the walk in red. To zoom in/out just click on the map to see it fully on Social Hiking. 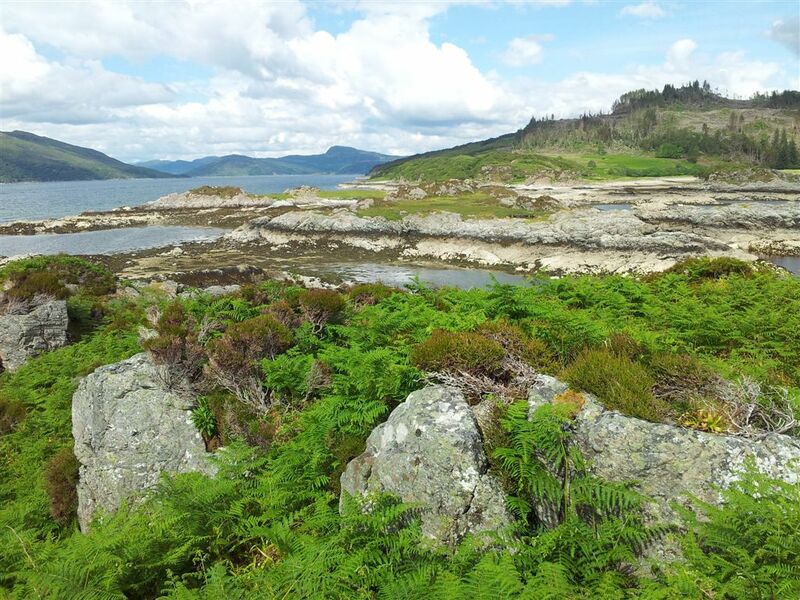 More details of the route on Walk Highlands or just ask! 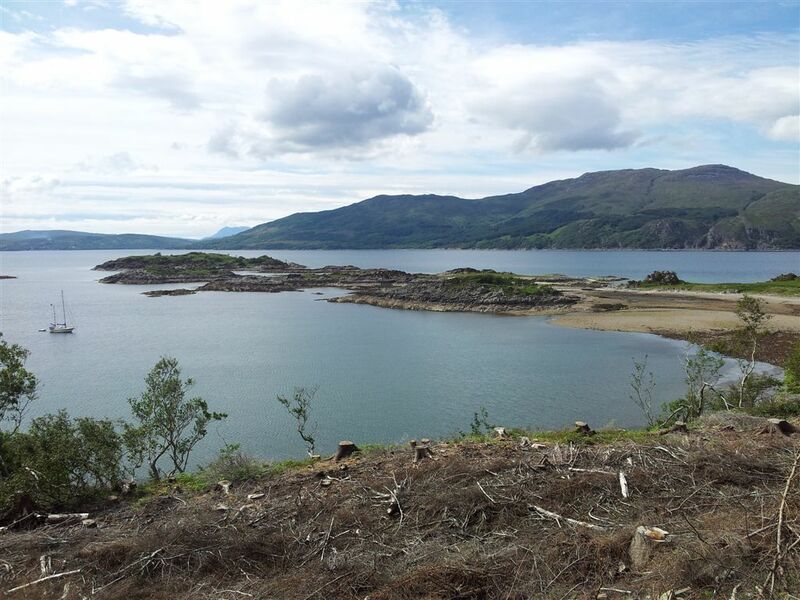 Sandaig Islands Update July 2014 – Quick update to stress the best visiting time is at low tide for the Islands and also a fern warning. 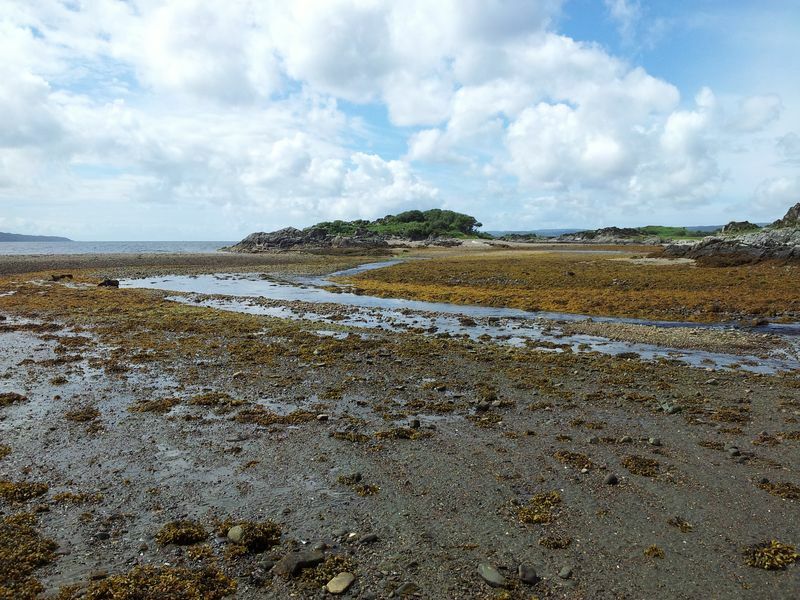 At low tide you can get out to all but the last island. Sometimes the shallow stream pictured below can involve a wet feet/boot crossing when getting from the beach to the Islands. Not a huge problem, kids take their shoes off, I managed a careful dry boot crossing. 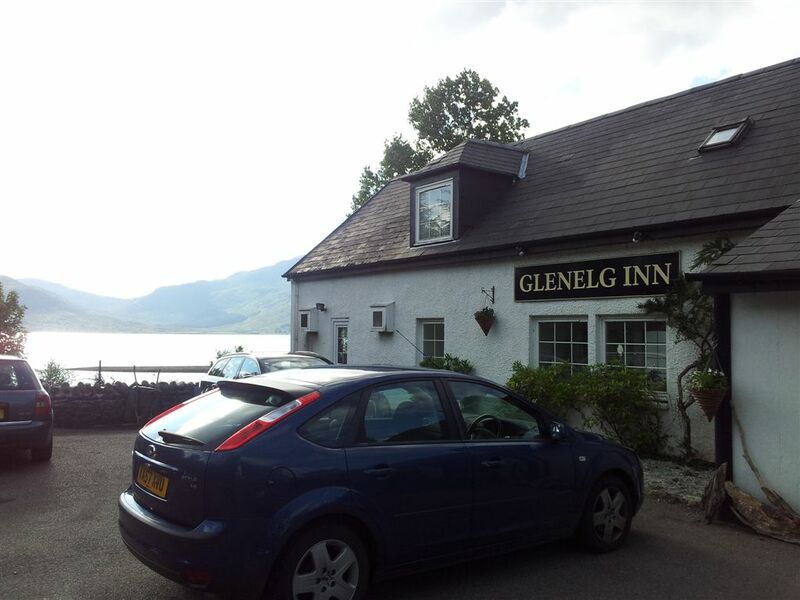 On the drive back from Sandaig we diverted for a welcome pint at the Glenelg Inn, a very rare proper pub in the Highlands. Looks a decent place to stay/eat although most tables already had ‘Reserved’ on them by 6.40pm, so if you want to eat best to book. 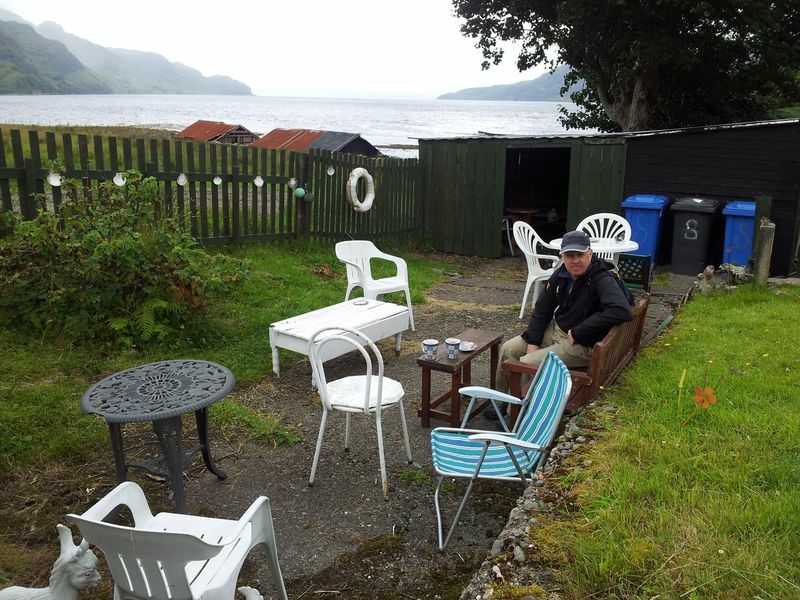 We sat in the hot pub garden, possibly the best pub garden view in the world, watching the tide coming in and the ferry to Kylerhea, (once the main Skye ferry until rail came to Kyle). This was yet another one of those places you really didn’t want to leave. 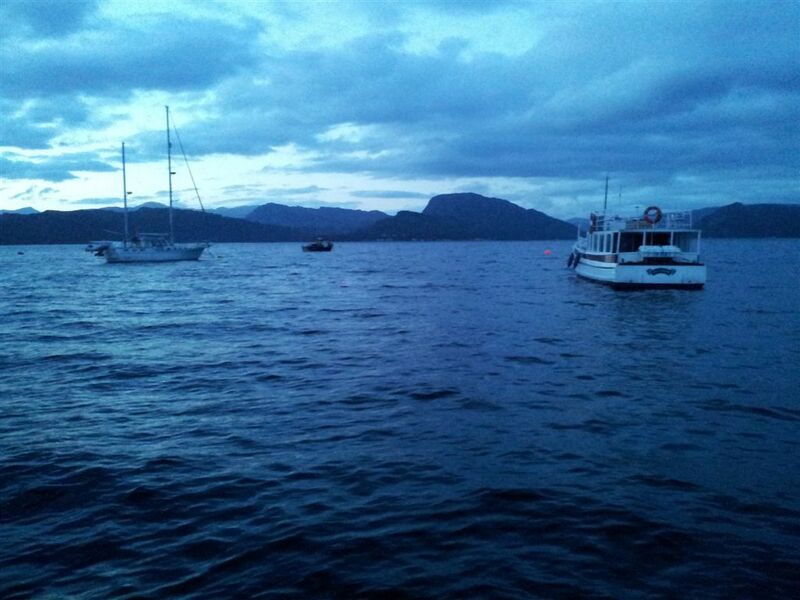 Reluctantly we dragged ouselves away as later that evening we had a meal in Plockton booked. Clinging on to every last view we stopped at Mam Ratagan for the classic one over Shiel Bridge and the majestic Five Sisters (eventually climbed 1 year later). 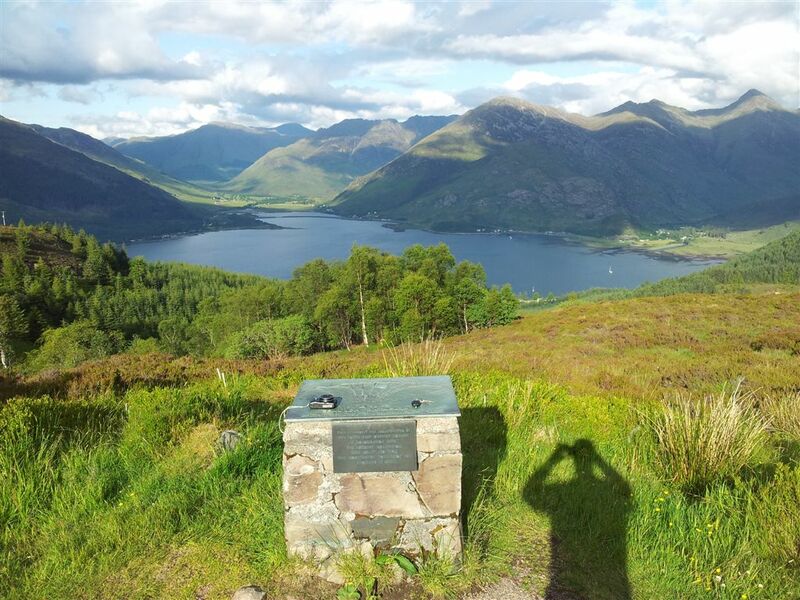 The Five Sisters of Kintail – slight foreground shadow problem here maybe? 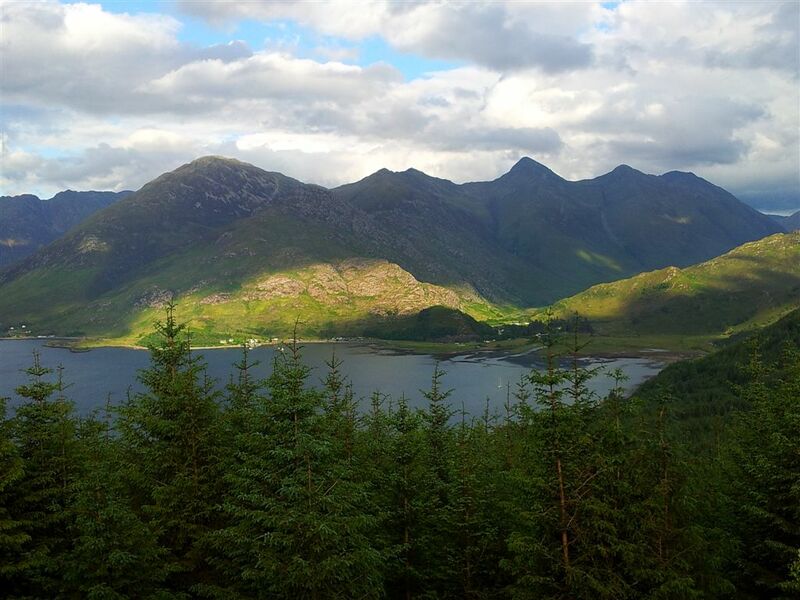 The Five Sisters of Kintail in full, not the best light but certainly can’t complain. 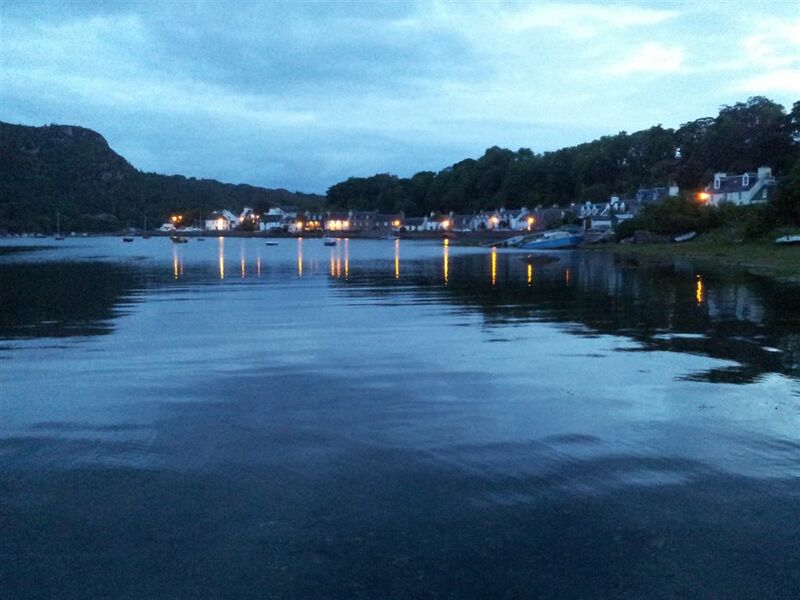 Finally back to Plockton for food, beer & the traditional evening walk across the causeway. 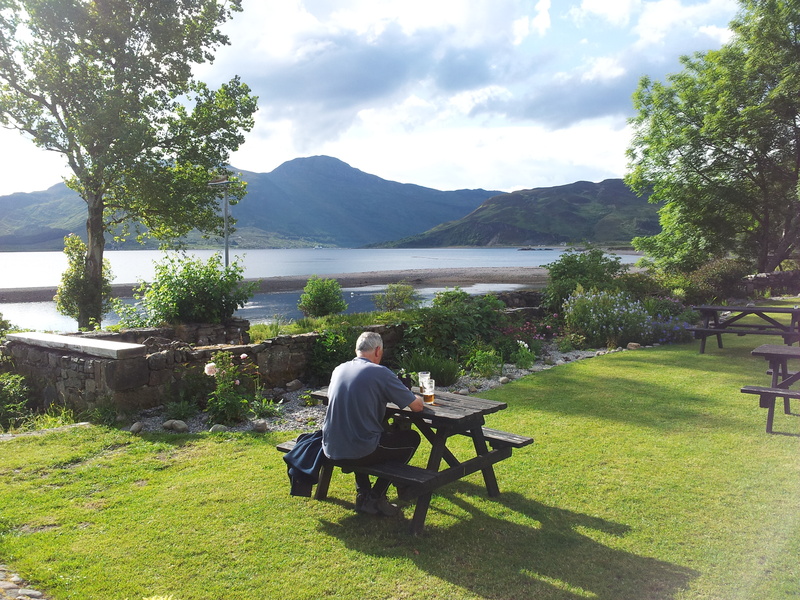 Followed by the traditional evening view from the floating pontoon east over Lochcarron. So after a crappy cold, wet, windy start to the day it had turned into a cracker – and all this despite a gloomy forecast saying it wouldn’t improve. We didn’t leave the guest house till midday and managed to pack a lot into the next eleven hours. Also just goes to show it’s not all about Munro’s, there’s plenty of variety and surprises in the Highlands especially around the wonderful coasts. 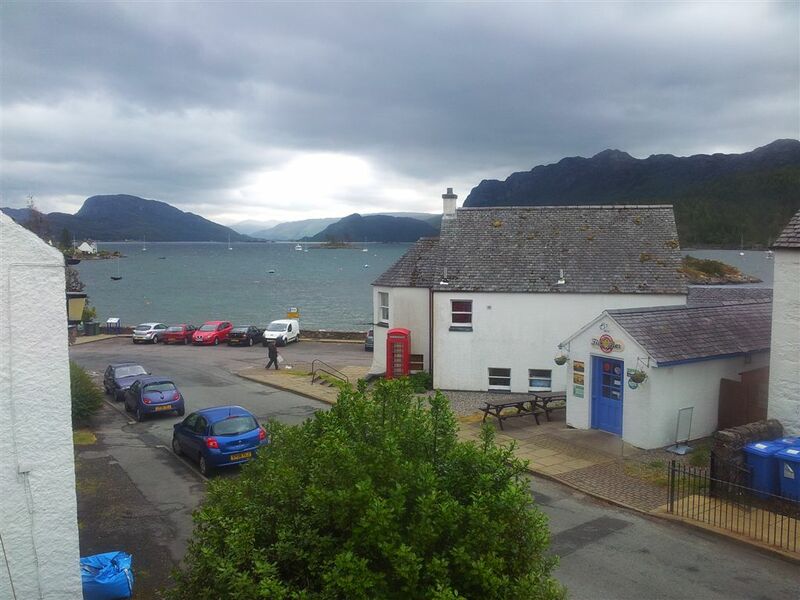 As we supped our pint of Plockton Ale……in the Plockton Inn……in the village of Plockton, we looked forward to what tomorrow would bring. 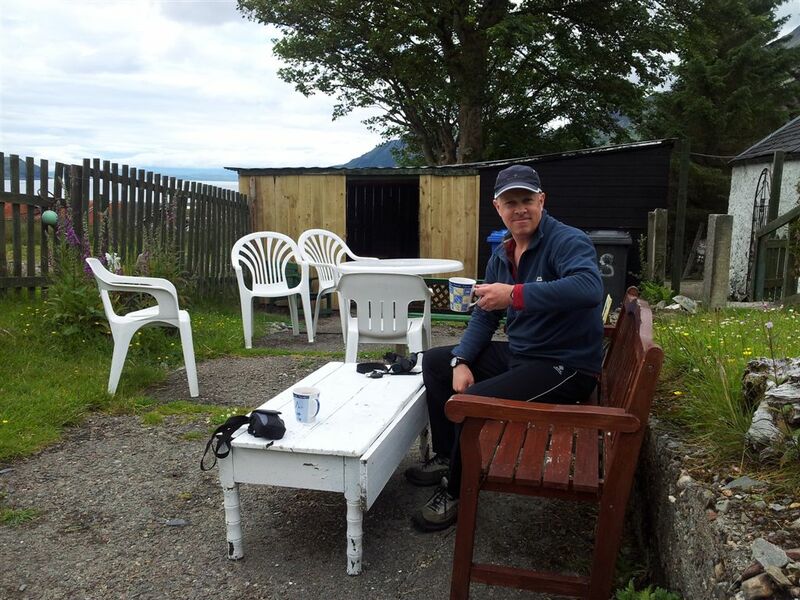 Update – Sheenas Tea Hut & the Sandaig islands has now become our traditional morning diversion each time we leave Plockton for the drive home. I urge you to try it and please do so in good weather to make it extra special. Thanks for reading. 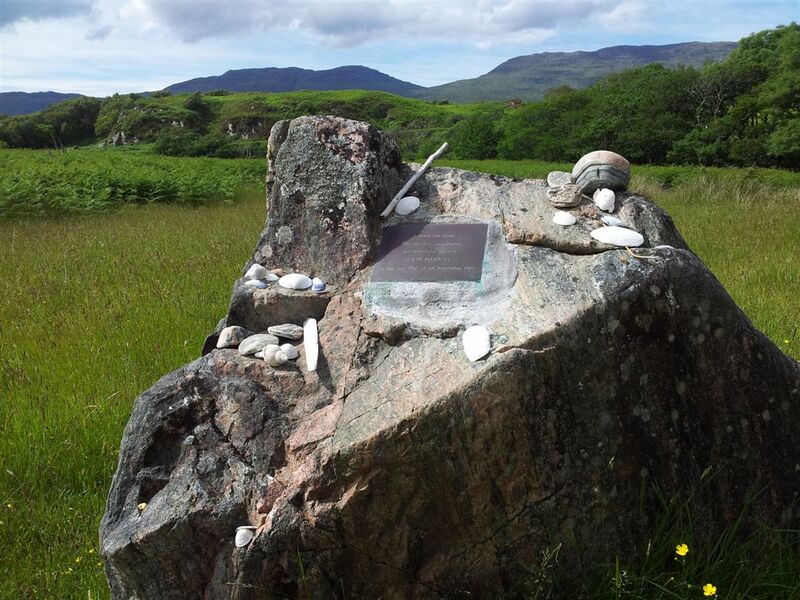 Here’s some info on the area Glenelg & Arnisdale with a link about Gavin Maxwell plus that interesting article on Maxwell’s life and legacy. Glenelg Bay tide times. 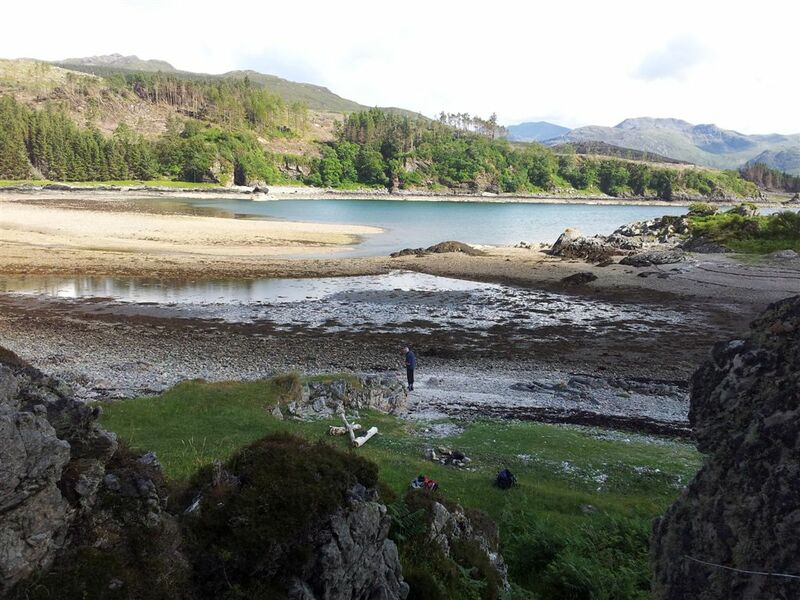 This entry was posted in Scottish Highlands & Skye and tagged Arnisdale, Camusfearna, Corran, Gavin Maxwell, Glenelg, Knoydart, pint, Ring of Bright Water, Sandaig, Sandaig Islands route, seals, Sheenas Tea Hut, Social Hiking, travel. Bookmark the permalink. Thanks, I don’t know how long Shona will be around serving tea but either way this is a fantastic trip on a nice day. Thanks authoress Tanya 🙂 Places like this are a wonderous find, make you want to smile. It’s a long trip but if you ever get the chance….Shona would love your heels!! Thanks Jamie, only ever saw the film once, at Sale Odeon, probably when it came out in 1969! I recommend Sgritheall too for one of THE best mountain views. Many thanks for the update and link. Have already updated the blog to reflect the news. 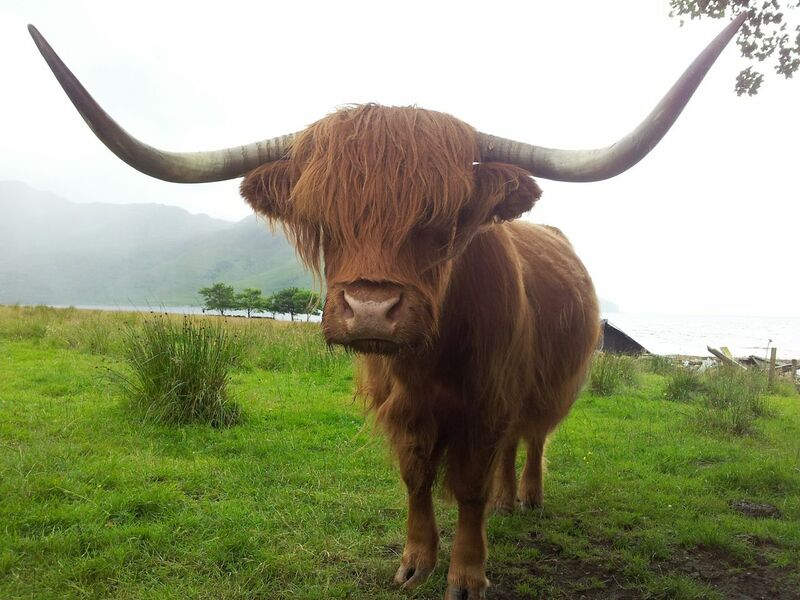 Sad news that Sheena will no longer be there but good news she is still around and hopefully having a rest in busy Uig. And wonderful news that the Tea Hut continues, hopefully for many years. Thanks again, I’ll be there late June/early July for a cuppa.